Preheat the oven to 200° C (top and bottom heat) and prepare the dressing. Puree the peeled potatoes with the joghurt, chervil and the peeled garlic and season with salt and cayenne pepper. Lie the peeled asparagus on the aluminium foil and sprinke with sea salt and the leaves from the sprig of thyme. Cover with flakes of butter. Close the foil and bake the asparagus package in the oven for 30 minutes. Meanwhile, wash the salat, separate the leaves and dry. Mix the lemon juice and olive oil in a bowl and toss the salad in it. 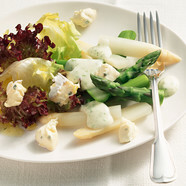 Remove the asparagus from the foil and serve on plates together with the salad. Sprinkle with the finely cut CAMBOZOLA and pour over the potato dressing. When asparagus isn’t in season, the salad can be made with smoked and roughly cut trout fillets, and during the winter with lamb’s lettuce.